Latin Cookin’ with an Asian Kikk! 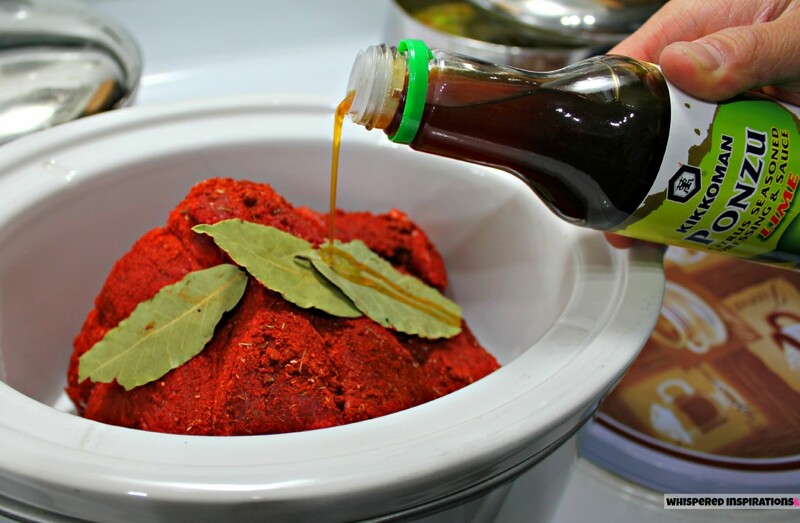 Well, as many of you know, Hubby and I absolutely love cooking and when thinking of a perfect marriage of a traditional Salvadorian dish that I grew up with, along with the flavors of the East–I thought BEEF! It kind of made me chuckle because, well, Hubby is Asian and I am Salvadorian and we go together perfectly! Anyway, I decided to make one of my favorite dishes my Mami used to make (and one that I occasionally sneak over for till this day), Carne Deshilachada con arroz y enselada fresca! 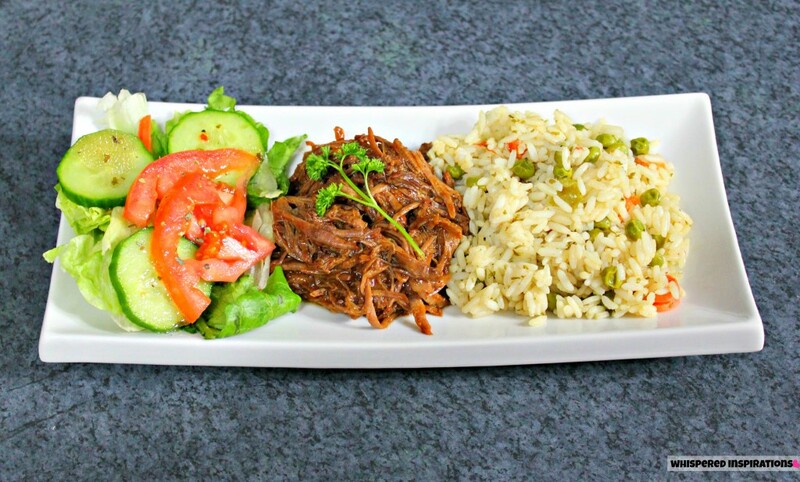 That’s Shredded Beef with Spanish Rice and Garden Salad. But, to give it an Asian flair, I used Kikkoman sauces and transformed it into Lime Teriyaki Carne Deshilachada con arroz y ensalada. The delicious Kikkoman Ponzu Lime Sauce and the Kikkoman Teriyaki Sauce. 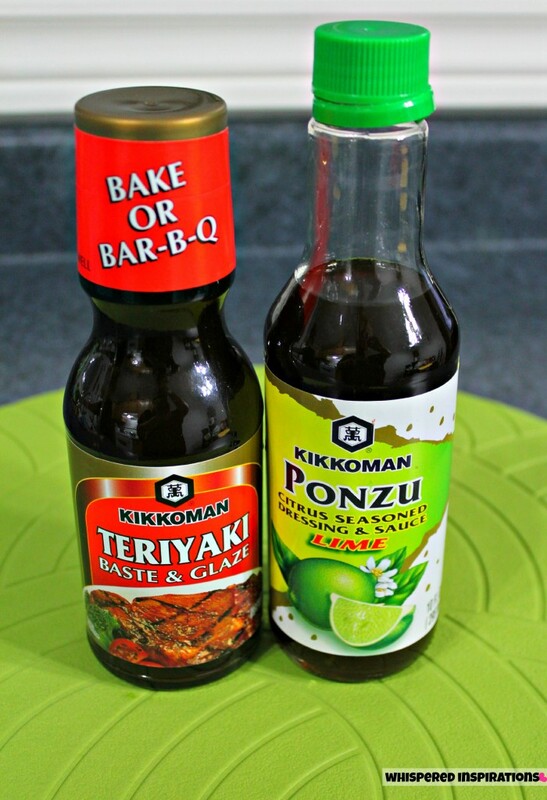 If you are unfamiliar with Kikkoman, you are totally missing out, they have quite a few sauces and marinades and chances are, you have definitely used their soy sauce! You can check out Kikkoman to see all their products and to check out other delicious recipes you can make with their yummy sauces, here. 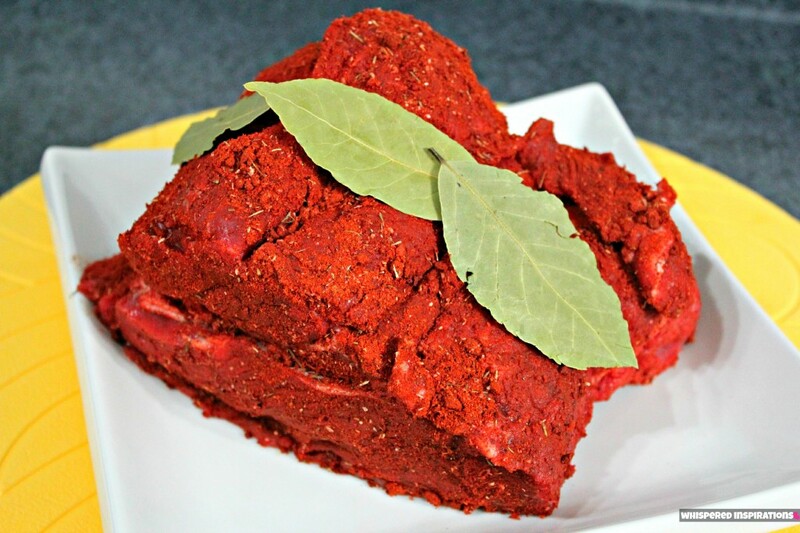 Take your favorite dry rub and give your beef a little love, make sure you spread the rub thoroughly and massage into the meat. Make sure that every little inch is covered, don’t forget the bottom, sides–all around! 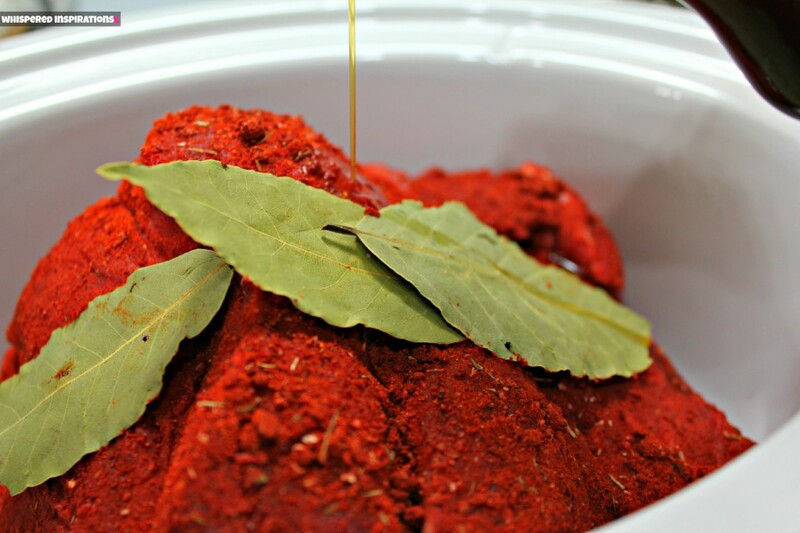 Top your chuck roast with bay leaves for extra flavor and grab that Kikkoman Ponzu Sauce! Grab That Kikkoman Ponzu Lime! This is where you can decide how you want to cook your beef. There’s quite a few choices that will result in the same delicious outcome! You can either use a pot where you can boil the beef chuck roast in either water or beef broth, this makes for shorter cooking time. Or you can use a pan to fry it, though I find this way makes the meat less tender than the latter. 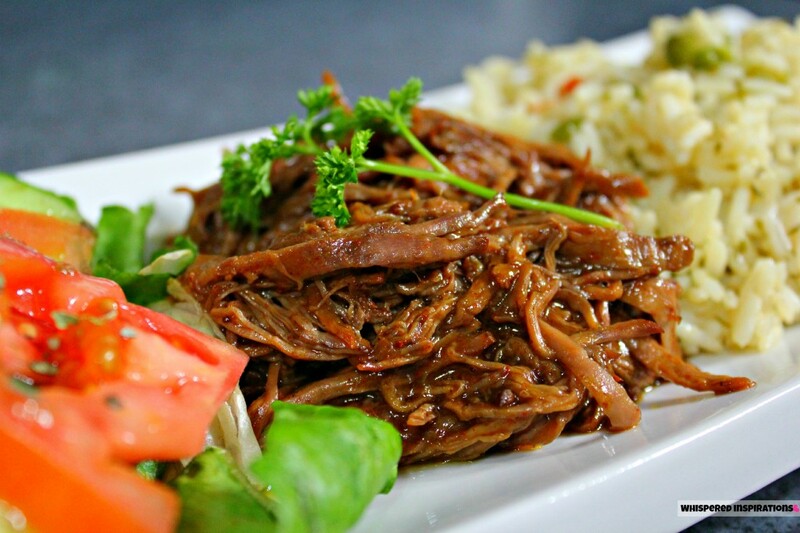 But, if you are in no rush, you can use a slow cooker for mouth watering results! But, to keep it under 60 minute cook-time, I suggest you boil it! I poured about 1/3 of the Kikkoman Ponzu Lime Sauce bottle and poured it all over the chuck roast. I let it sit for about 5 minutes so it can soak up the flavor of the sauce. It really gets the juices going. After letting it sink in, I added pre-made beef broth to my cooker and let it simmer to perfection. If you are boiling it, you do the exact same thing. Dry rub, add Kikkoman Ponzu Lime Sauce, soak and then add broth or water and simmer to perfection! 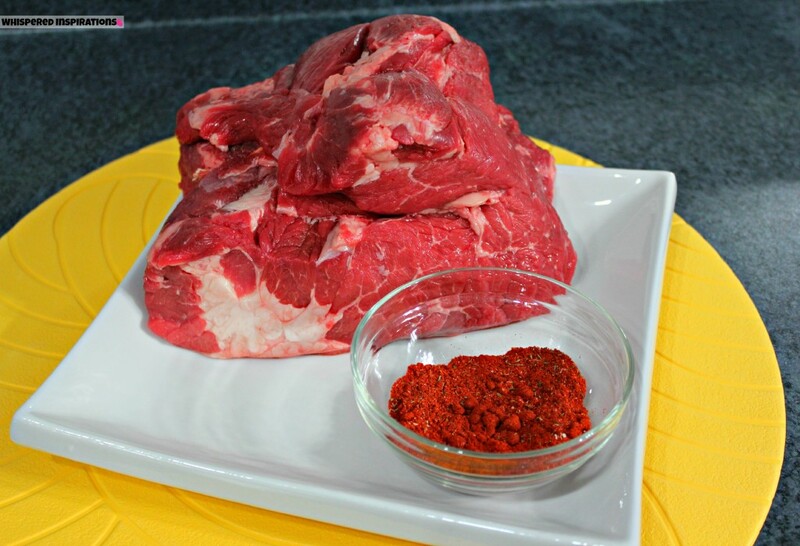 In between boiling, you can cut the chuck roast in large pieces for faster cooking. 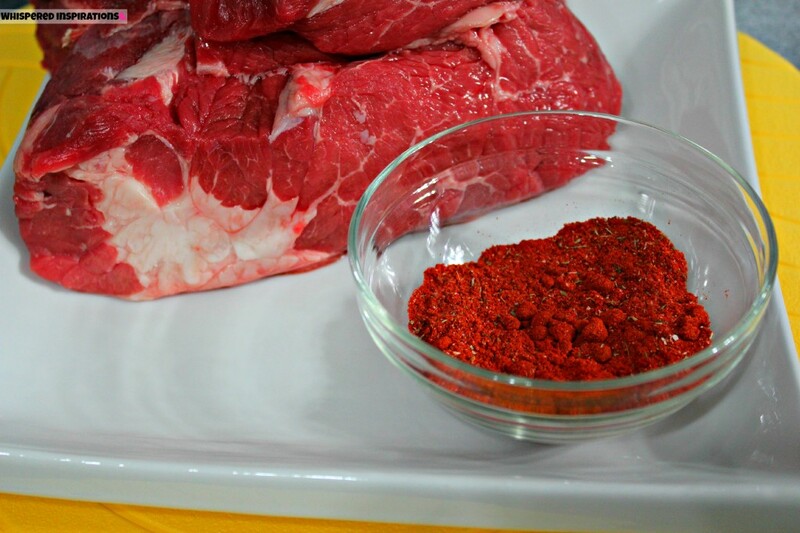 Once the beef chuck roast is cooked to your preference, remove beef with a pair of tongs from the broth. Use two forks and begin to shred and separate beef. It should be super tender and break apart easily. Remove about 3 parts of the broth and set aside, leave the remaining broth and add your shredded beef to it. Use tongs to mix it until the broth is completely covering the beef. Add the entire bottle of Kikkoman Teriyaki Sauce–mix well and you’re done! The result is sweet and tangy shredded beef! I served it with my favorite Latin side dishes, like our staple rice and salad. Este es un plato que todos en mi familia puede disfrutar. Ya que tenemos tanto de Asia y América en la sangre, que es perfecto para nuestro hogar! It turned out super delicious and it got gobbled up, I even brought some over for my dad. It’s one of his most favorite latin dishes that his mom used to make for him too and I knew I had to have him try it because he would be honest! He said it’s perfectly sweet, tangy and salty! Different yet deliciously satisfying and if I say so myself, it’s pretty darn good! Be sure to “like” Kikkoman over at Kikkoman Kitchen on FB and @KikkomanKitchen on Twitter! Always posting new updates and inspiring recipes! You can find my recipe on Kikkoman’s website, here. What are your favorite ethnic dishes and do you ever combine the best of two different worlds? Note: This post is in collaboration with Latina Bloggers Connect and Kikkoman. Please see Whispered Inspirations terms. oh, does that ever look yummy. I am not very adventurous in my cooking, but I think hubby would love that! Oh Nancy this looks and sounds DELISH!!! When going with ethnic meals, our go to is Indian food. YUM. My recent post #wordlesswednesday – Orangie's Lunch..w Linky! This looks absolutely fabulous! I have not seen the Lime Kikkoman, will be on the look out now. I usually don't mix ethnic recipes but this sounds like a great idea! That looks yummy! I know some Spanish so knew what almost all the words in the dish was except Deshilachada. Now I know it's shredded but I think it's funny that it looks almost like delicious! Perfect. My recent post Twinkle Toes Wrinkled! I've seen these products in the grocery store, but never knew what to do with them. This recipe looks absolutely amazing! And now I know what to do with these sauces.Thank you so much. I'm going to get them the next time I go to the store. The picture makes me want to lick my laptop screen! Thank-you so much, it\’s very easy to make and I must say, so very tasty! Looks very yummy! My fav sauce. I've never heard of Kikkoman Ponzu Lime Sauce. Your recipe looks easy to follow and the presentation is really nice! It looks really good. I love ponzu and didn't know kikkoman made one. looks great! nice presentation! had no clue what ponzu was before now so thank you!! This recipe looks yummy but my kids are allergic to paprika is there another spice i could use in its place? As i would love to try this recipe for supper sometime. This looks awesome, I'm always looking for new beef recipes! Into my recipe folder this goes! Wow – what a yummy-looking transformation! So delish! I love the use of Ponzu sauce. I had heard about it on Food Network shows but wasn’t exactly sure what it is or how to use it. Now, I do! My mouth is watering! Kikkoman teriyaki is the best and this looks great. I love anything teriyaki! This looks so good. Definitely need to give it a try one of these nights! I really want to try that Kikkoman Ponzu Lime Sauce. This recipe looks yummy! That recipe looks absolutely amazing! I have printed it off and am going to try it this week! Thank you! Yummy! That looks and sounds extremely delicious. Where do you buy the lime sauce? I'll have to check Superstore for it on my next shopping trip and then this is going on my meal plan for next month! Can't wait! Let me know how it goes! Check your sauce aisle or ethnic foods! I didn't know they have ponzu sauce! Oh look so good ! Now I have to go get a slow cooker because I want to follow that exactly! Mmm lovely! I would be tempted to serve it with chickpeas! Wow, this looks so good, I'm definitely "pinning" this one to try out for myself sometime soon! Thanks! That looks amazing! Thanks for sharing the recipe. We swear by Kikkoman in our house so this is something I'd be willing to try!